Today’s rapidly aging infrastructure has left miles and miles of roads in urgent need of upgrades and repairs. Funding has not kept pace with the need, especially for base correction and full-depth hot mix asphalt paving. Paved roads with insufficient structural capacity to support increasing traffic loads, roads that are too narrow, and roads with excessive potholes, dust and rutting slow commerce by impeding the flow of people, goods and services. 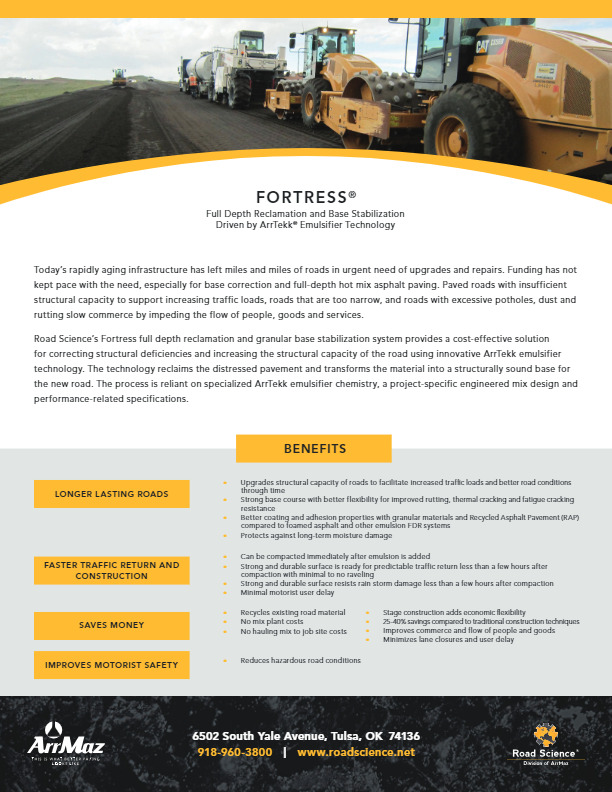 Road Science’s Fortress® full depth reclamation (FDR) and granular base stabilization system provides a high-performance, reliable and cost-effective solution for correcting structural deficiencies and increasing the structural capacity of the road. The technology reclaims the distressed pavement along with a section of the underlying granular base and transforms these materials into a strong, yet flexible, upgraded and structurally sound base for the new road. The process is reliant on specialized ArrTekk® emulsifier chemistry, a project-specific engineered mix design and performance-related specifications. 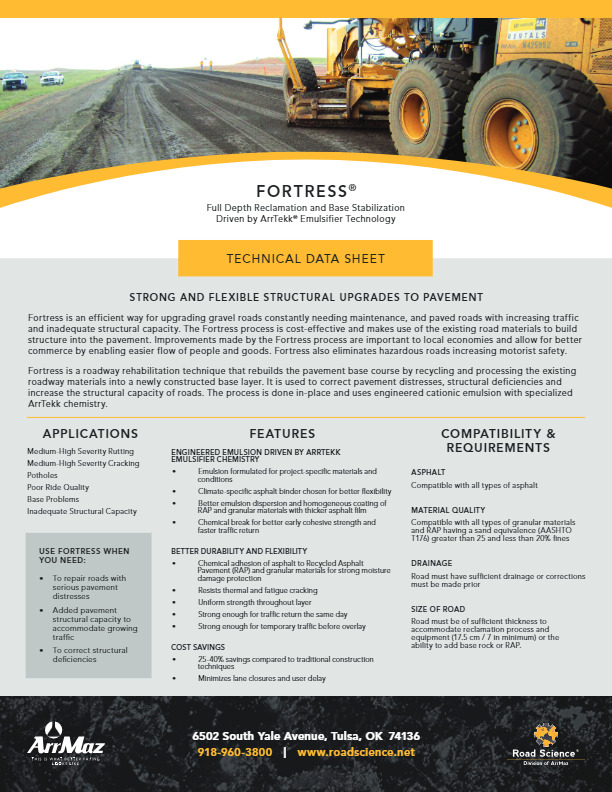 The Fortress full depth reclamation process provides many advantages and benefits to all stakeholders including the motorist public. Minimal lane closure time and reduced user delays minimize inconvenience to motorists and disruptions to local commerce. Agencies benefit from a 25-40% lower-cost solution compared to conventional pavement construction, which is environmentally responsible and reuses existing materials.